The foundation of present-day North District Middle School was laid in 1945 when Dr. (then Reverend) H.J. Brooks arrived in Varnville, S.C. as the Head Teacher/Principal of the Varnville Colored School. Under Dr. Brooks, the Varnville Colored School grew from an incomplete building without hear or electricity with four classrooms, four teachers, and eighty-four students in the 1945- 46 school year to the modern brick structure with 903 students that serves as North District Middle School today. The process was a slow, arduous one with the school year lasting only eight months in Dr. Brooks’ first year, but being expanded to nine months in 1947 with the eighth grade being added. Progress continued with the addition of the ninth grade in 1948 and the school’s name being changed to Varnville Junior High School. Grades continued to be added until 1951 when the first graduates of Varnville High School were issued their diplomas. In an attempt to circumvent the Brown vs. Board of Education Supreme Court decision, the former building was erected and opened during the 1953-54 school year. 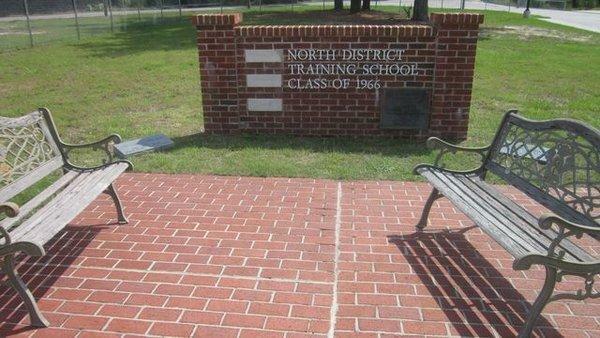 It was named the North District Training School, the school offered and academic curriculum as well as courses in agriculture, masonry, and home economics. The school became a fully-accredited high school in 1958. When total integration finally came in 1970, all tenth, eleventh, and twelfth grade students at North District were transferred to Wade Hampton High School which became the only high school in the district. North District served as the home for all Varnville- area students through eighth grade plus all Hampton District One ninth graders until 1976 when the ninth grade was also moved to Wade Hampton. In 1978, Dr. Brooks retired and one of his former students at North District Training School, Willie F. Coker, took over the reins at the school. Under his guidance and leadership, North District thrived as the home of Varnville-area fifth through eighth graders until 1993- 94 when it became the middle school for all of Hampton District One’s seventh and eighth graders. Today, it still serves the community in this capacity.